Research projects strike fear into the heart of most students. These big projects also strike fear into the hearts of teachers because they require a lot of planning and take FOREVER to grade! Grading complex, long term assignments is overwhelming because there is so much to do all at once. Google Classroom can help. Instruct your students to copy and paste that portion of their assignment from Google Docs (or whatever they are using) into the question you created in Google Classroom. The result is a nice, neat list of student work right in Google Classroom. You don't need to open up 25 different Google Documents (big time saver)! You can now provide feedback directly from Google Classroom which students can apply to their paper during the next class period. If you do this for each component of your assignment, by the time your students turn in their final project, you have provided feedback on each individual component. The final grading process should be relatively quick. 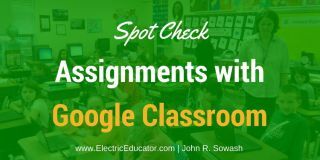 John Sowash creates useful resources for educators on his blog, The Electric Educator. John is the author of The Chromebook Classroom and founder of the Google Certification Academy. You can connect with John on Twitter (@jrsowash) and Instagram.